The first thing we do when we hire a new employee is get them setup with all the best tools and hardware. We make sure they have a Macbook, get them a SoFriendly email address, add them to our Slack group. The next part is arguably the most fun I ever have and that’s downloading all my favorite apps on their laptop and phone. I’m a fanatic when it comes to being efficient and maximizing my time. I can’t stand wasting time fooling with something when I have projects to deliver and designs to, well, design. There’s also a part of me which is just, lazy. I love a tool that saves me time, but also makes for less work on my end. There’s certain tools when it comes to my Macbook such as Flux or Bartender, that I just have to have, but they aren’t part of the standard set of needs everyone has, such as a good word processor, or an internet browser. Those apps are so common people even put them on their resume (Pro-Tip: please stop doing this people.). One of the biggest nightmares that every IT guy has to deal with though, is email. Everyone needs email, everyone reads emails, everyone sends emails, and everyone has to have a way to do those things. This is where Newton comes in. Newton used to be called CloudMagic, and while a lot of it has changed, along with the name, the core of the product really remains the same. In my neverending search for the best way to email I came across CloudMagic. At that time there was no Mac app, but it really was the most solid mobile experience I’d seen to date. I started using it but ultimately stopped because I needed parity between my laptop and mobile email clients. 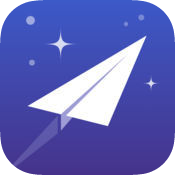 Every time I’d switch off of CloudMagic onto another mobile email client though I’d get frustrated within days and go back. Emails would be missing, the app would slow down over time, or would crash while I was writing an important email. This just NEVER happened with CloudMagic. Then the most amazing thing happened. CloudMagic launched a native Mac App. That was all I needed to delete any other email apps from both my phone and laptop. My email experience has never been better. I receive hundreds of emails an hour across 5+ accounts. Newton helps make that manageable. ‍CloudMagic eventually renamed itself to Newton and along with that added a whole host of features making it even more indispensable as it was before. Previously if I wanted to track an email for sales purposes, I had to fire up Mixmax or some other Gmail extension just to send 1 email. It also meant I couldn’t send tracked emails on my phone which was something I often need to do. With Newton, I no longer need to use any other 3rd party systems to track emails, it’s all built in. This alone warranted Newton an immediate required install on all new hires’ computers. No one should ever send a single email without tracking on it. It completely changes the way you think about engagement and sales. Even just checking to see if one of my own marketing leads has read an internal email! The other amazing upside to this is that unlike competitors there’s no limit on how many tracked emails you can send. Outside of email tracking Newton comes loaded with a massive amount of integrations and features. At this point in my workflow, I’ve completely gotten rid of task lists and to-do apps and I use Newton instead. Newton’s snooze feature is unbelievably handy and reminiscent of the wonder that was Mailbox (RIP). I continually star and snooze emails as a way to keep myself on track throughout the day and week. This is incredibly helpful for when an email comes in but I know I shouldn’t distract myself with it in that moment. I simply snooze and get to it when I can. One other feature that might only affect power users like us, but is worth mentioning, is the “cloud” nature of Newton. We all swap phones quite frequently here at SoFriendly. I’m constantly switching between a Galaxy s7 and my iPhone 7 or even a Blackberry once in awhile. The beauty of the way that Newton handles your account is that I can easily log into the app on a new phone and boom my email magically shows up nearly instantly. 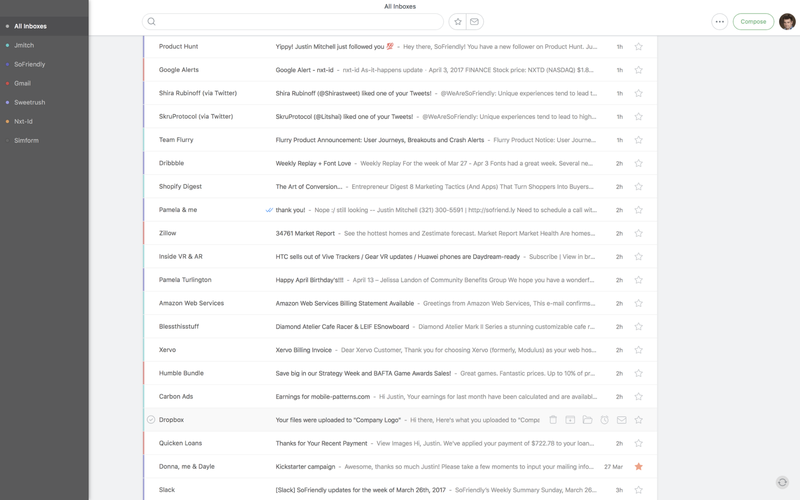 It doesn’t need to download gigabtyes of stored IMAP mail and unlike Gmail or others, I don’t need to manually log into 6 different email accounts one by one. It’s all synced and ready to go the moment I log in. I’ve tried countless email clients and none of them come close to offering what Newton does. Since we love the product so much, we are giving away a few copies of Newton for iOS and we may or may not have a couple available for Mac as well (keep an eye on the GetSyrup Twitter account). Highly recommend anyone who is looking for a solution to their crazy email routine to check out Newton. If you don’t end up winning in the giveaway but just can’t stand the thought of living without Newton in your life, shoot us a DM on Twitter and I’ll buy you a copy myself, that’s how much I love this product.